Anniversary celebrations at Lake Oconee, Ga.
July 31, 2018--Fourteen years ago, at just about this time (5 p.m.), Jim and I stood under a beautiful willow tree in our back yard and exchanged vows. The willow tree has died; my friend, Ginny, who performed the ceremony for us also passed away several years ago. But, we live on. It took a long time to find my life partner, but I am grateful I did. We are not home celebrating; we are at a lakeside campground on Lake Oconee, near Greensboro, Ga.
A view of Lake Oconee from our campsite. The day is overcast. Shortly after purchasing our current RV, we sat through a presentation lauding the benefits of RV resort membership. Well, we've been there, and done that. In our first year of RV ownership, we traveled out West and were suckered into buying a similar membership. On the surface, these memberships really sound good--and they are, for many people. But we are not resort people. We use our RV as a movable hotel. We discovered our RV lifestyle after we shelled out a couple thousand dollars for the membership. So, when we went to the presentation last September at a resort outside of Orlando, we already knew we did not want to join. However, for sitting through the presentation, we were given three free weeks of free camping at any of the Travel Resorts of America campgrounds. The one outside of Orlando (in Orange City, Fla.) was a new acquisition for TRA, and it was a long way away from being classified as a resort. So, we decided to get away to the one in Georgia, a comfortable six-hour drive. We arrived yesterday afternoon. This "resort" is on Lake Oconee, a beautiful, big reservoir outside of Greensboro, which is a friendly, quaint town of about 3,500 people. I put resort in quotes for a reason: Like its Orange City counterpart, it is far from being a classy resort. It is a KOA, with some amenities already made, and many more to be made (supposedly). 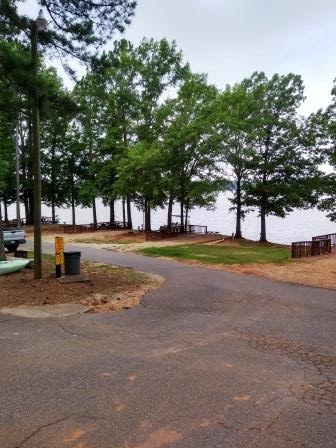 It has two pools, a sandy beach, fishing piers (no license required when fishing on private property), and (best of all) wonderfully fast WIFI. It also has a slanted RV sites (and our RV does not have levels), crumbly roads, and sometimes smelly sewers. I would not pay to stay here. The RV sites are tiered because of the hills around here, and many (including ours on the third tier) have a view of the lake. We are only about a 100 yards from the shore. When we arrived yesterday, it was sunny. Today has been overcast and sometimes rainy. I hope the rest of the week will be comfortable so that we can do some fishing, and hopefully some catching.